Love this site! Geology rocks, and so does geometry. This wonderful park site is only open in the summer, sometimes not until July! Check their website or call before you visit. Getting to the site is by shuttle bus from the ski area in Mammoth Lakes, unless you have a campground reservation down in the valley. Once there enjoy this unique geologic feature, make sure to hike to the top of the postpile. This site is considered Senior Friendly as there is no upper age limit. If you are over 10 years of age then you are to complete at least 10 of the 12 activities. The activities are; The Prepared Hiker, Attend A Program / Interview A Ranger, Geology Rocks, Trace Your Trail, National Parks are Everywhere, Using Your Senses, The National Park Service, Scavenger Hunt, Devils Postpile: Fire & Ice, The Scenic San Joaquin, The Rainbow Fire, and Leave No Trace. By far my favorite activity was Geology Rocks, as previously I had looked at the wall of rock at ground level. This activity had you draw the structures seen from ground level and then from on top. Seeing the geometric shapes on top which form the columns was great. 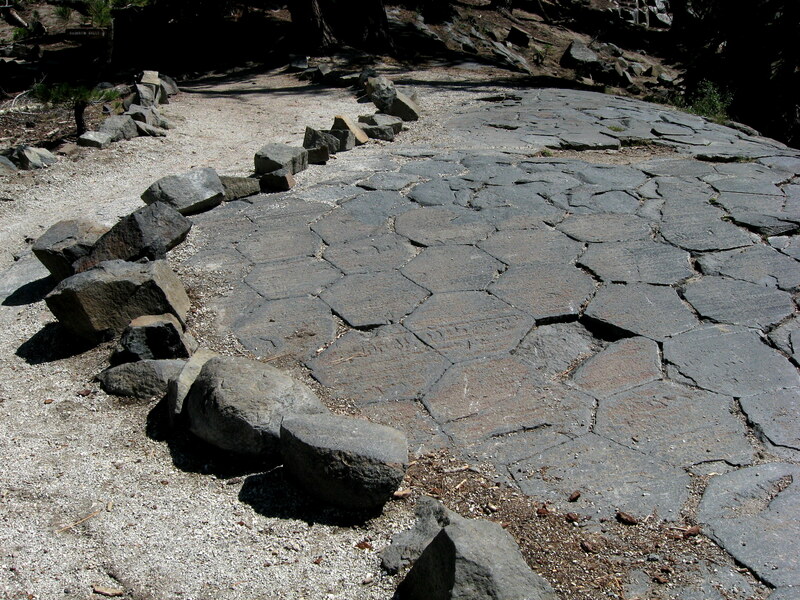 While up there you can also complete the activity, Devils Postpile: Fire & Ice by recording the shapes of at least 10 columns, I found; 2 square, 3 pentagon and 5 hexagon-shaped columns. The Scavenger Hunt had six items to discover and draw which is always a challenge for me, but good practice. Using Your Senses was another drawing activity. I spent some time drawing the Summer Tanager I saw while hiking in the area. Even though it involved a Word Search I learned something surprising about this area, the river in the valley is the San Joaquin River. This is a river I have seen on the west side of the Sierras, so I was surprised that its headwaters were in a valley on the east side. Goes to prove, you can always learn something new when completing a Junior Ranger program. The very best part of this visit was having my booklet reviewed by Ranged Elsa. We both recognized each other, it took a few moments to remember where we had previously met. The Fall before she had been the ranger in Yosemite who had awarded my grandson and I our Junior Ranger badges. I received a very attractive patch, in the shape of a hexagon, of course. 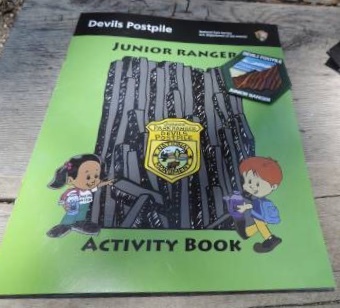 This entry was tagged Basalt, California, Devils Postpile NM, Junior Ranger, Mammoth Lakes. Bookmark the permalink.